This week my list is all about sport apps.I asked my husband to help me make the picks because I'm hopeless when it comes to sports. He was happy to oblige and gave me a list of his favorites. We're in full hockey mode at our house so of course NHL Game Center was at the top of the list. 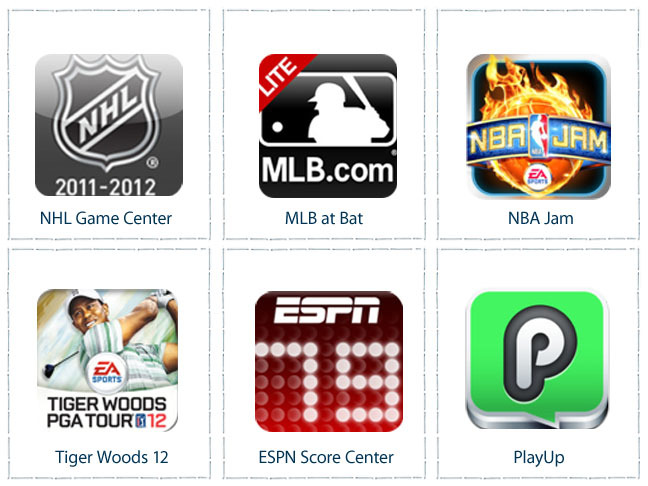 MLB at Bat is fantastic for keeping up with the baseball season and NBA Jam is his answer to the basketball strike. The Tiger Woods golf game is always a safe bet and I don't know what a Saturday would sound like without the ESPN app sounding off every time a college football score updates on his phone. Finally there is PlayUP, a brand new global social network centered around live sport. Hopefully this list gives you something to share with your sports loving friends!